The weather just couldn’t have been better in the NC mountains than it was this past weekend for the 38th Annual Fall Festival at the John C. Campbell Folk School in Brasstown, NC! Of course there is always the great food and smells of BBQ, kettle corn and fried apple pies in the cool Fall air too. We missed the cloggers performing while we were visiting with past clients, but there was plenty of music and dancing in the Festival Barn Stage and Craft Shop Stage. Lots of demonstrations of blacksmithing, enameling, woodcarving and other Appalachian crafts throughout the festival. The kids could enjoy the Pony rides and who wouldn’t want to load up in the Wagon for a ride around the Folk School grounds? There is something for everyone at the John C. Campbell Folk School Fall Festival so if you didn't make it this year make sure you’re there next October for the 39th Annual Fall Festival in Brasstown, NC Mountains! 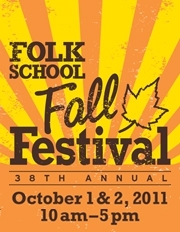 Make sure to add a visit to the John C. Campbell Folk School to your calendar!